Illustration. The Calvin cycle is a process that plants and algae use to turn carbon dioxide from the air into sugar, the food autotrophs need to grow. The Calvin cycle is a part of photosynthesis, the process plants and other autotrophs use to create nutrients from sunlight and carbon dioxide. The process was first identified by American biochemist Dr. Melvin Calvin in 1957. The Calvin cycle is a process that plants and algae use to turn carbon dioxide from the air into sugar, the food autotrophs need to grow. Every living thing on Earth depends on the Calvin cycle. Plants depend on the Calvin cycle for energy and food. Other organisms, including herbivores, also depend on it indirectly because they depend on plants for food. Even organisms that eat other organisms, such as carnivores, depend on the Calvin cycle. Without it, they wouldn't have the food, energy, and nutrients they need to survive. 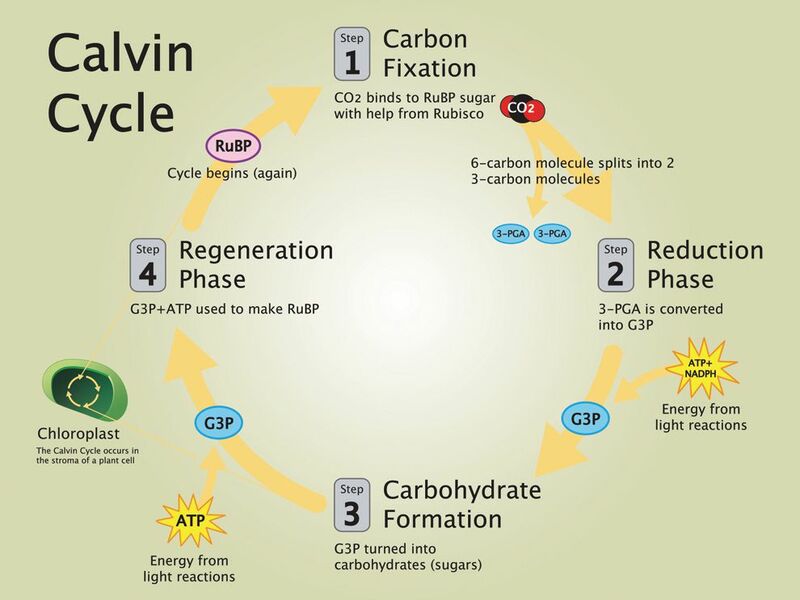 The Calvin cycle has four main steps: carbon fixation, reduction phase, carbohydrate formation, and regeneration phase. Energy to fuel chemical reactions in this sugar-generating process is provided by ATP and NADPH, chemical compounds which contain the energy plants have captured from sunlight. (adenosine triphosphate) chemical found in most living cells and used for energy. person who studies the properties and reactions of chemicals in living or once-living material. series of reactions that take place during photosynthesis, where carbon dioxide and water from the atmosphere are converted into sugar. method plants use to attach carbon dioxide from the atmosphere to a chemical (RuBP) in order to start the process of photosynthesis. (nicotinamide adenine dinucleotide phosphate) chemical found in most living cells and used for energy. second step in the Calvin cycle of photosynthesis, where energy reacts with chemicals to create the simple sugar G3P. fourth and final step in the Calvin cycle of photosynthesis, where energy and sugar interact to form the molecule RuBP, allowing the cycle to start again.